The Borland Database Engine (shortly BDE ) is an interface of the company Firma Borland Inc. to access databases. It provides the access to well known databases as dBase and Paradox .
" Error initializing the Borland Database Engine ". At this moment it is obvious that not the software is bad but there's no compatible instalation of the BDE for Windows 10, 8, 7 and Vista present. With "Windows Vista" Microsoft introduced a lot of changes regardingthe file acces and rights of users and programs. Per default the original BDE is'nt made for Windows 10, 8, 7 and Vista specific environment conditions. This does'nt mean that BDE is'nt a professionel database system. Well installed the BDE runs on Windos 10/ 8/ 7 /Vista as confidential as ever on other Windows systems. "BDE eXpress" itself is'nt a database. It provides the BDE interface for other applications under Windows 10, 8, 7 resp. Vista. 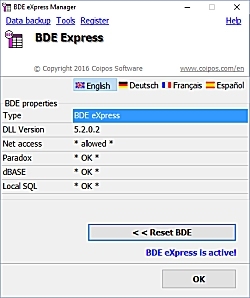 The setup of "BDE eXpress" installs a special adapted version of the BDE for applications that access to Paradox and dBase databases with the BDE under Windows 10, Windows 8, Windows 7 or Windows Vista . The "BDE eXpress Manager "
allows to activate and deactivate "BDE Express Windows 10 / 8 / 7 / Vista"
restauration of the initial state before install "BDE Express"
When do I need "BDE eXpress"? If a new program version is working now with server based data and you have to import former BDE databases you need a funcional BDE under Windows 10, Windows 8, Windows 7 or Windows Vista. If a puchased program runs well under Windows 98, ME, 2000, NT or XP and does'nt work now under newer Windows versions cause of problems with the BDE. The Original BDE Administation does'nt permit modifications of the configuration under Windows 10, 8, 7 and Vista even with Admin rights, e.g. to configure the computer for net access of a Paradox database. You've created BDE applications during years and are willing to offer this aplications also for Windows 10, 8, 7 and Vista. You want to convert in a near future your BDE applications into server based aplications. To convert existing data stocks of your clients you need apart of the server database a funcional BDE under Windows 10, 8, 7 and Vista. In this case you may include a special BDE eXpress Windows 10 / 8 / 7 / Vistainstallation into your own setup. This silent BDE eXpress will install and initialize the BDE during the setup process of your software. "BDE eXpress " supports apart from the global alias names also User Aliasnames . These alias names are only valid for the current user and may be modified even without admin rights. In the Admin Mode are also visible the Original BDE Alias names for common use on the PC. "BDE eXpress Manager " as well as "BDE Express Backup " use both types of naming dat stock. Under Windows 7/Vista (and already on Windows XP) data not should be stored in the same folder as the program itself but in the user specific directories. "C:\Documents and Settings\[Name of the user]\My Documents\ ". In contrast Paradox tables of version 7 support long filenames. With "BDE Express Backup " one may convert automatically whole data stocks into the modern Paradox 7 Format . You may install "BDE eXpress for Windows 10 / 8 / 7 / Vista" also on other Windows operating systems if you wish a compact installation of the BDE. you may restore the former intallation any time with then "BDE eXpress Manager"
the former state will be restored automatically after uninstalling "BDE eXpress Windows 10 / 8 / 7 / Vista"